Frequently Asked Questions are addressed here. Just click on the topic for the answer. Some questions and answers are excerpted from The Do’s and Don’ts of Hypoglycemia: An Everyday Guide to Low Blood Sugar. Return frequently since we will be adding more Q & A’s. Please understand that the opinions expressed by the experts should not be construed as a specific diagnosis or treatment recommendations. These answers are offered to provide a framework of information pertaining to commonly asked questions about hypoglycemia and related metabolic health issues. Remember that nothing takes the place of a medical diagnosis and treatment plan. If your symptoms persist or are severe, seek medical attention! In medical terms, hypoglycemia is defined in relation to its cause. Functional hypoglycemia, the kind we are addressing here, is the over secretion of insulin by the pancreas in response to a rapid rise in blood sugar or “glucose”. All carbohydrates (vegetables, fruits and grains, as well as simple table sugar), are broken down into simple sugars by the process of digestion. This sugar enters the blood stream as glucose and our level of blood sugar rises. The pancreas then secretes a hormone known as insulin into the blood in order to bring the glucose down to normal levels. Because all the cells in the body require glucose for energy, the symptoms of hypoglycemia are as varied as there are people who have the condition. Symptoms can be mental, such as depression, anxiety, confusion, insomnia, irritability, and even thoughts of suicide. Physical symptoms include fatigue, headaches, dizziness, fainting, convulsions, irregular heartbeat, sweating, and cold hands or feet. Food addictions, food sensitivities, or food cravings are also common in hypoglycemia. Feeling hungry, in spite of having recently eaten, is also a sign of hypoglycemia. What are the main causes hypoglycemia? Medical conditions, such as tumors of the pancreas or adrenals can cause hypoglycemia. Type I and II diabetes can result in hypoglycemia when insulin or other glucose lowering medications are not followed by food intake. Gastric Bypass surgery can result in post-prandial (after eating) hypoglycemia due to “Dumping Syndrome.” Functional or reactive hypoglycemia, which is the kind we are addressing here, is caused by poor diet, stress, and lifestyle. A diet high in refined sugars and carbohydrates is a common theme among diagnosed hypoglycemics. Stress is another common cause of reactive hypoglycemia. Poor diet and stress usually go hand-in-hand. Persons who suffer from a lot of stress often reach for those high sugar, high starch comfort foods to help them deal with the stresses in their lives. This is a perfect breeding ground for the development of reactive hypoglycemia. People whose lifestyles gives them little time for sleep, relaxation, or play, can easily develop reactive hypoglycemia. The five-hour glucose tolerance test (GTT) remains the gold standard for diagnosing hypoglycemia. The patient fasts overnight and a baseline blood glucose level is drawn. A cocktail of glucose in water is then consumed. Blood glucose levels are drawn at 30 minutes, one hour, two hours, three hours, four hours, and five hours from the time of the glucose consumption. If the blood glucose falls below fasting levels at any time during the test the patient is diagnosed with hypoglycemia. Another common response to the five-hour GTT is what we call a “flat curve.” Glucose levels do not fall below fasting, but they do not rise in response to the glucose load that was consumed. This, too, is diagnostic of reactive hypoglycemia. There are many practitioners who consider the five-hour GTT too stressful for patients. Therefore, alternative methods of diagnosing reactive hypoglycemia have been used successfully. These include allowing the patient to eat a high carbohydrate breakfast as the glucose load prior to the 5 hour GTT. Other practitioners consider a fasting glucose below normal to be suggestive of reactive hypoglycemia and treat the patient accordingly. Still other healthcare professionals, who suspect reactive hypoglycemia, place the patient on a high-protein, low carbohydrate diet. If the patient responds favorably, the clinical diagnosis is made. What is the best diet for for those who suffer from hypoglycemia? The best diet for hypoglycemia is one that is high in protein, moderately high in fact, and low in carbohydrates. Frequent feedings are often necessary to control long-standing functional hypoglycemia. The diet for hypoglycemia is designed to avoid a drop in glucose, NOT fix it after it falls. Eating sugar in all its forms, as well as eating refined carbohydrates, triggers excessive reaction by the pancreas. They must be avoided. There is a genetic tendency towards this condition, but much of the your pancreas is doing is caused by poor diet and lifestyle choices. In patients with type I diabetes the pancreas can no longer secrete insulin. It must be supplied by insulin injections. Hypoglycemia in type 1 diabetics is the result of excess insulin injections or insulin injections taken without food. In type 2 diabetics, the pancreas has the ability to produce some insulin. However, it has been abused by poor dietary choices. Therefore, excess insulin production is seen as a desperate attempt by the pancreas to continue working. This, as well as too much glucose-lowering medication, can result in hypoglycemic episodes. A type 2 diabetic will need to follow the same high protein low carbohydrate diet as the reactive hypoglycemic. How does stress and lifestyle related to hypoglycemia? Stress is a common cause of reactive hypoglycemia. Just as eating refined sugars and carbohydrates rapidly raise blood glucose levels, stress can do so as well. The adrenal glands, that sit on top of each kidney, produce adrenaline and noradrenaline in response to stress. These hormones are designed to raise the blood sugar, raise the blood pressure, and ready the body to fight or flee. Chronic stress will, therefore, produce chronically high blood glucose levels. The pancreas will respond to this condition by chronically secreting insulin. The resulting hyperinsulinemia results in hypoglycemia. Too much work, lack of sleep, and chronic stressful relationships, can all result in hypoglycemia, even if the diet is adequate. The brain’s preferred fuel source is glucose. Hypoglycemia starves the brain of this much needed fuel. When blood glucose is low, the brain will not function properly and all the symptoms of disturbed mental health can result. We have heard the term psychosomatic, which means emotions can affect our physical health, positively or negatively. 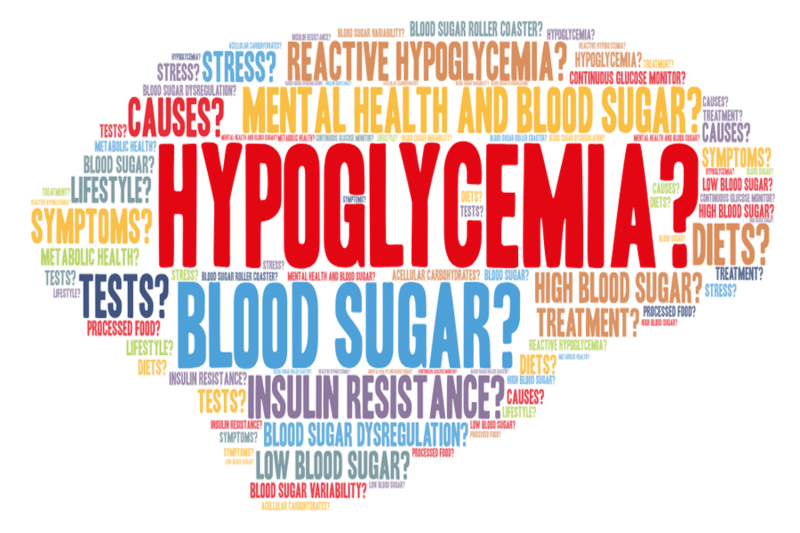 In hypoglycemia our physical health (hypoglycemia) is negatively affecting our mental health. The term is “somatopsychic,” and it is just as real. What information is available for health professionals? Most types of (reactive/functional) hypoglycemia are preventable and diet-related. Sadly, nutrition education is sorely lacking for doctors and healthcare professionals and has actually been declining over the last four decades. This is one reason why many healthcare professionals do not properly understand hypoglycemia and how to treat it, relying heavily on drugs and devices rather than diet and lifestyle change. The Hypoglycemia Support Foundation is working to change this, by developing high quality Continuing Medical Education (CME) for health care professionals. The HSF works with leading health care providers and institutions to develop educational partnerships and projects, like the first comprehensive infographic on hypoglycemia for patients and their healthcare providers. As CME programs become available, we will post the links here. We can only share with you what has helped many others. Consider making a pot of homemade chicken soup / or vegetable soup the day before you have to fast. Remove all the solids from the soup leaving just the broth. If you can’t make it yourself, purchase it fresh locally. As a last resort, get it from your local market deli. On the day of the fast, sip the broth throughout the day. Rest as much as possible, sleep if you can and stay calm and positive. Do what works for you…read a book, watch TV and meditate…anything that doesn’t add stress. The day of the test, bring a snack with you, such as peanuts or whole grain crackers with cheese, that you can eat immediately after the procedure. Any tips on choosing a physician? Do choose a physician carefully – and preferably not during an emergency situation. Ask for physician referral from friends, neighbors, family and business associates, hospitals and organizations. If you have a physician’s name you are considering, first call the office and ask if this doctor tests and treats hypoglycemia? Do they provide nutritional counseling? If the answer is no, can they refer you to someone else? What is their fee and do they accept insurance? Once you’ve made your appointment, prepare a written list of your symptoms, as well as past medical records and bring that with you to your first visit. It is wise to also bring a diet/symptom diary, which should include a list of everything you’ve eaten, or medication you’ve taken in the past 5 to 7 days, as well as the times you ate and any symptoms or reactions afterwards. Click here to download and print your own, or here to view an electronic form. Do prepare a list of questions, and don’t hesitate to ask them. Write down any instructions you receive. Discuss a complete prevention program. Discuss your concerns and symptoms…it helps to have a list printed out when you arrive – sometimes we feel flustered or embarrassed when discussing personal health issues with a doctor and a list helps you to be sure you cover everything going on with you. Get a second opinion, especially if you’re not satisfied with your first physician. Remember that there are many caring, sensitive, trustworthy physicians out there who test and treat hypoglycemia. If at first you don’t succeed in finding one, try again! Excerpted & condensed from The Do’s and Don’ts of Hypoglycemia: An Everyday Guide to Low Blood Sugar. To understand how stress can adversely affect this condition, a little physiology lesson might be in order. You cannot separate the psychological from the physical. When you suffer from stress (real or imagined), your physical body reacts with what is known as the “fight or flight” response. The adrenal glands secrete the catecholamines, epinephrine and norepinephrine (adrenaline), which raise the blood glucose levels to prepare the body to fight or flee. Once that occurs, the pancreas begins to over-secrete insulin, and the blood glucose yo-yo begins. The drop in blood glucose is real! So, you need to be even more diligent with your diet during times of stress. I also believe that once you understand how stress, like poor diet, can set off hypoglycemia, you will understand the need to control both. Also, the more overanxious you become about this condition, the more difficult it will be to get it under control. I have been diagnosed with hypoglycemia and am grateful I already see a big difference in my health and attitude since going on a hypoglycemia diet. However, I would like to stop my medication. I take antidepressants and tranquilizers. I don’t think I need them anymore. Any suggestions? Congratulations on that fact that just changing your eating habits has made such a significant change in your life. Most likely you’ve omitted one or more of the big offenders—sugar, white flour, alcohol, caffeine and tobacco. Whatever your approach, it is working. Hurray! As far as decreasing your medications and eventually getting off of them, it is imperative that you work with a healthcare professional who not only tests and treats hypoglycemia but also who knows your medical history, the type of medications you are on and the dosage. I can only share with you what helped me. After my official diagnosis of hypoglycemia, a physician who combined holistic healthcare with orthodox medicine was a huge help to me. In time, vitamins, exercise and stress reduction techniques aided in my healing process. Although my doctor slowly started reducing the dosages of my medication, it wasn’t until I was introduced to hypnosis that was I able to get off them completely. Through deep relaxation, guided imagination and suggestions, and the help of a professional hypnotherapist, my goals were reached. If you ever think of using hypnosis or any other type of alternative therapy, I urge you to learn everything you can about the treatment. Then take this information to your physician and decide together if this may be something you should consider. Since depression can be caused by a chemical imbalance, hypnosis alone may not work for you. DO NOT stop your medication on your own, and if you are advised that you can stop it, make sure you are under medical supervision while doing so and report any symptoms such as worsening depression, suicidal thoughts or other side effects immediately. 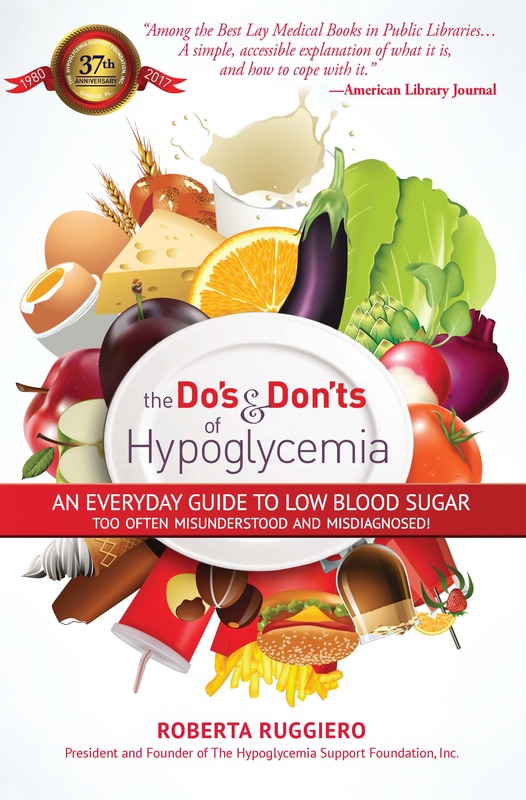 —Roberta Ruggiero, Founder of the Hypoglycemia Support Foundation and Author of Do’s & Don’ts of Hypoglycemia : An Everyday Guide to Low Blood Sugar Too Often Misunderstood and Misdiagnosed! Is there just one thing that causes hypoglycemia? Over the years, a number of books have been written on Hypoglycemia. 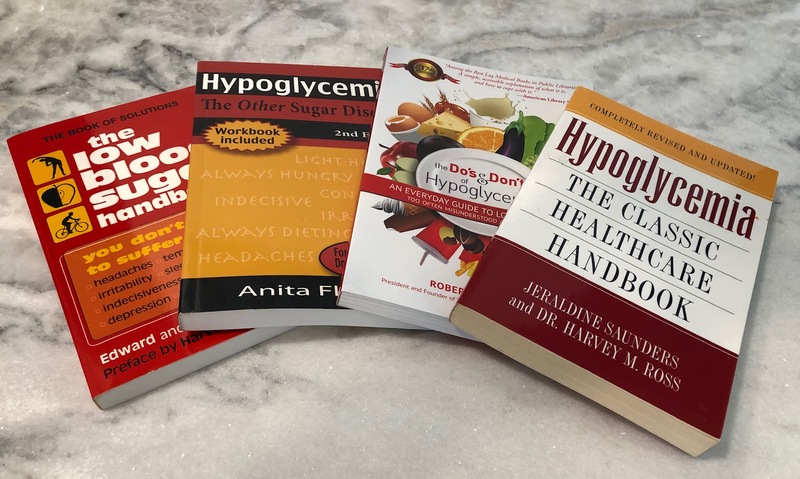 Only one has been reprinted in a 5th Edition – Hypoglycemia Do’s and Don’ts, written by Roberta Ruggiero, Founder of the Hypoglycemia Support Foundation. Click below to learn how to get your own copy of this book. Roberta Ruggiero saved my life. When I was first diagnosed I didn’t know where to turn for help. I stumbled on her book, The Do’s and Don’ts of Hypoglycemia, at the local library and decided to contact her for some advice. I was a total stranger and this amazing angel called me weekly to give me advice and make sure I was doing okay for months. I will forever be grateful to her. Parker has chronic hypoglycemia. In the past, he had daily symptoms, was hospitalized frequently, and struggled to stay focused in school. The Do’s and Don’ts of Hypoglycemia has been a true blessing for us. Parker relates to some of the personal stories and information on foods, and learning what to add or subtract from his diet has been a wonderful tool for me. The chapter of FAQ’s has been an invaluable resource that we refer to time and time again. Parker still struggles, however Roberta’s book enables us to make changes in his diet that ensure his success.